Branson dons lippie and fishnets after losing bet that his Virgin Formula 1 team would beat Air Asia boss Tony Fernades' Lotus Cosworth. Branson never misses an opportunity to look like a numpty. Remember that stunt at the launch of Virgin Brides? Or the recent pants-flashing incident to promote Little Red? This time around, however, he's gone the whole hog - and not just because his attempt at looking like an air stewardess is a prime example of the 'silk purse out of sow's ear' idiom. Back in 2010, the Virgin billionaire made a bet with Air Asia's Tony Fernandes at the Abu Dhabi Grand Prix that his Formula 1 team would thrash the Air Asia team. He lost, and after several foiled attempts to honour the bet (a skiing incident, the Royal Wedding and the fire at Necker Island all led to the stunt being rescheduled), he has finally made good on his promise to dress up as an air stewardess on his rival's airline. This week, Branson put on a cabin crew uniform, along with some saucy fishnets and a full face of make-up (over his trademark beard, too) and served Fernandes on a flight from Perth to Kuala Lumpur. 'After having my legs shaved the night before, a delightful assistant helped put on my lipstick and red shoes before I got a lift (and a kiss) from my new boss Tony,' he wrote on his blog. The stunt raised more than $300,000 for children's charity Starlight Foundation, which both Virgin Australia and Air Asia support. 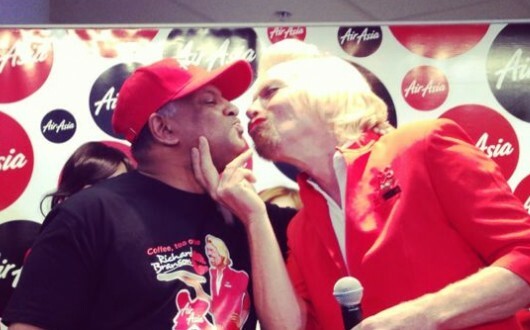 However, Branson's career at Air Asia was mercifully short-lived. 'He sacked me straight after the flight!' admits Branson.